It's a new year which means a new chance to do things differently. Or as we like to look at it... to enhance upon what we already do well. As we usher in 2016, we resolve to offer our customers an array of healthy menu options. And while we already feature a nice selection to choose from, our intent is to group them all together so anyone with dietary concerns can identify them more easily. While this menu page is in the fine tuning stages (we'll let you know when we have it mastered), our healthy menu page promises to offer a mix of current dishes with a handful of new and old specials. We have often joked that our menu boasts more healthy choices than some restaurants have choices, period! In 2016, our goal is to expand upon that. We will prepare dishes and offer the healthful benefits of grapeseed oil. We will bring in some of the freshest (at least for north central Illinois standards) wild caught seafood we can get our hands on. We may even play with the notion of grass fed, free range, GMO or hormone-free livestock. We discovered enough of these products in 2015 that we found we could put together an entirely different menu page to promote a healthier dining experience. We hope to offer dishes so enticing and beneficial, that you can still eat what you want and not feel guilty about it. We already mentioned the free range chicken entree as a terrific, healthy start to the year. Here are some other items you might see on our menu page of healthy dining options. All..........coming soon! We start with a bed of baby kale tossed with a housemade balsamic vinaigrette. It is then topped with a grilled free range chicken breast (no added preservatives or bi-products here) that is rubbed down with a simple marinade of salt, cracked black pepper, and grapeseed oil before being tossed with salemville blue cheese, blanched almonds and fresh raspberries. Gluten Free! We start with wild caught gulf shrimp, nothing farm raised, and top it with a housemade dejonghe butter that consists of white wine, garlic, onions and a secret blend of herbs. The base of the butter is simple - stripped down to the basics of cream and salt - and slowly churned to a rich consistency. 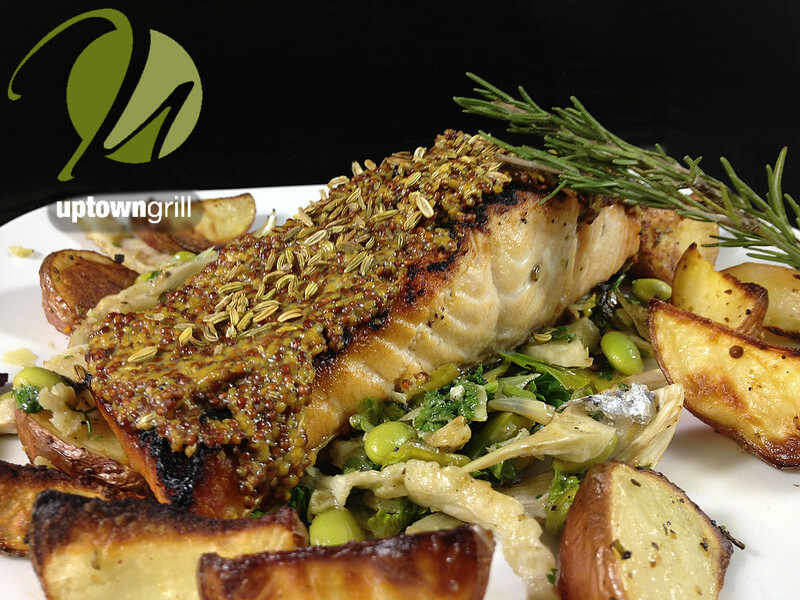 Wild caught coho salmon, rubbed with grapeseed oil, broiled and fennel crusted. Topped with stone ground mustard sweet butter. Coho salmon has a rich, reddish-orange meat with a medium flavor compared to sockeye or king salmons. It is arguably one of the most sought after salmon. 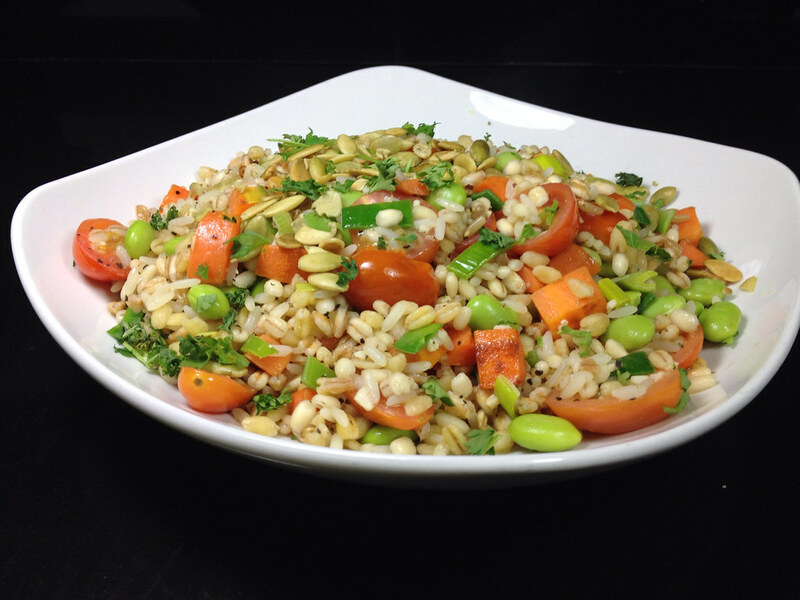 Italian five grain blend consisting of farro, barley, durum, basmati and whole grain oats. Served with white wine sweet butter, grape tomato, carrots, shallot and dried cranberries. When looking for protein, search no further. Add a salmon burger or seared tuna to this dish and you have yourself a meal.